The Barbara Jean Johnson Promenade extends east and west along Lane Avenue from Fyffe Road to Olentangy River Road. This upper walkway provides a connection with other sections of campus and easy access to all parts of the gardens. Built by local businessman John Johnson to honor his mother, the walk was completed in 1995 with wheelchair access in the parking lot bordering the south side of the Arboretum. A retaining wall, also donated by Johnson, was the original backdrop for the former Bert and Josephine Kleinmaier Perennial Garden (now located in the Learning Gardens). The retaining wall now serves as the backdrop for the a Taxonomic Collection of Conifers. Many trees, shrubs, and perennials of note can be found along the Barbara Jean Johnson Promenade. As you meander through the gardens, notice the plants along the path such as Malus domestica 'Melrose' (Melrose apple), Taxodium distichum (Bald Cypress), and Fagus sylvatica 'Tricolor' (Tricolor beech). 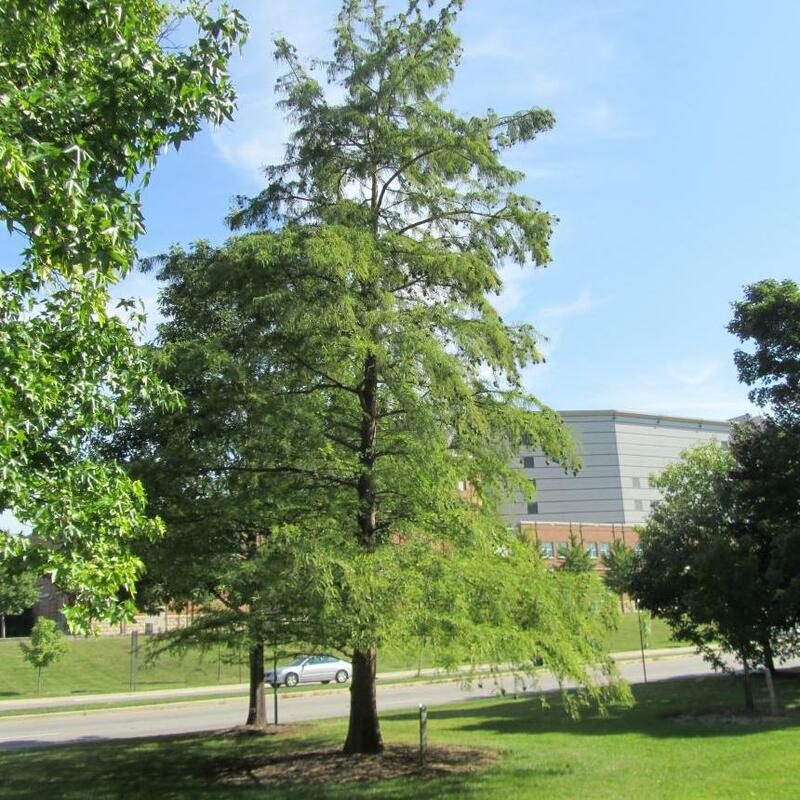 For a photograph and one or more links to information about these trees from The Ohio State University Plant Facts, Wikipedia, and/or USDA Plants Database, click Plant Search Database and simply enter the botanical name (genus only will work) of one of these trees or any tree on The Ohio State University Columbus campus. If you do not know a tree's botanical name, you can find it by searching the web using the tree's common name. We are in the process of adding QR codes to our plant labels throughout the arboretum. If you are walking in the gardens and see a plant label with a QR code, use your smart phone or tablet QR reader app to access a photograph and description or link to additional information about the tree. If you don't have a QR reader app, you can download one for free from your app store. Malus domestica 'Melrose' (Melrose apple) – The "Official Apple of Ohio"
The Melrose apple is one of Ohio State's claims to fame in horticulture. Most apple breeding is conducted at Cornell University and at the University of Minnesota. 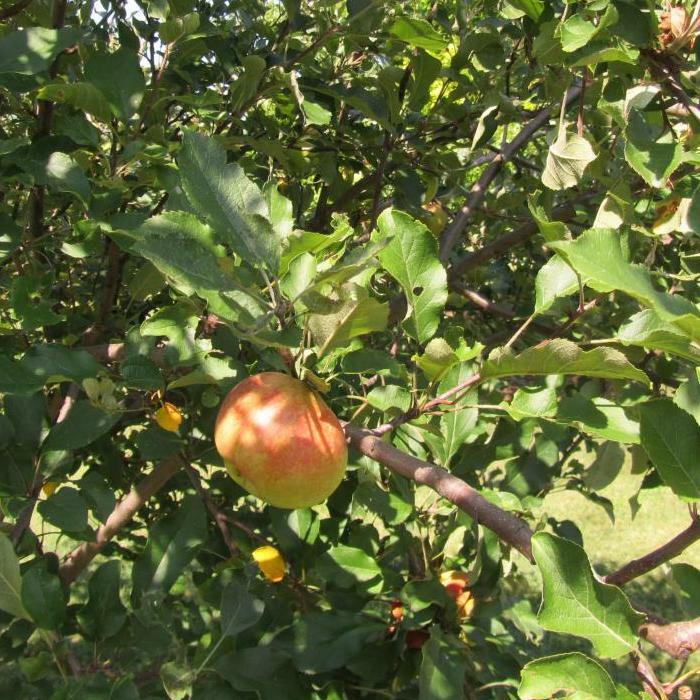 Introduced in 1944, the Melrose apple is the only one bred at Ohio State, and was bred by Dr. Freeman Howlett for whom Howlett Hall is named. It is cross between Red Delicious and Jonathan, and was named for Melrose Orchard in Wooster, Ohio. 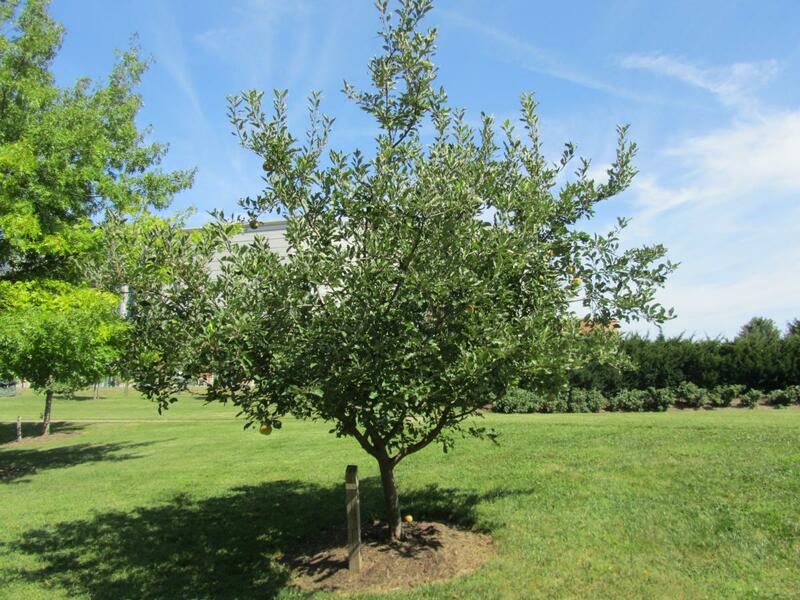 The Melrose apple tree pictured here commemorates Dr. Fred Hartman, an emeritus professor of Pomology at Ohio State who was mentored by Dr. Howlett. In 1921, when Dr. Hartman was age of seven or eight, he attended the dedication of the Ohio Stadium. Bald cypress is a very upright, pyramidal, stately tree that tolerates dry to very wet sites. It has fine-textured, medium green summer foliage, good orange-brown autumn foliage, ornamental red-brown exfoliating bark, and winter catkins. 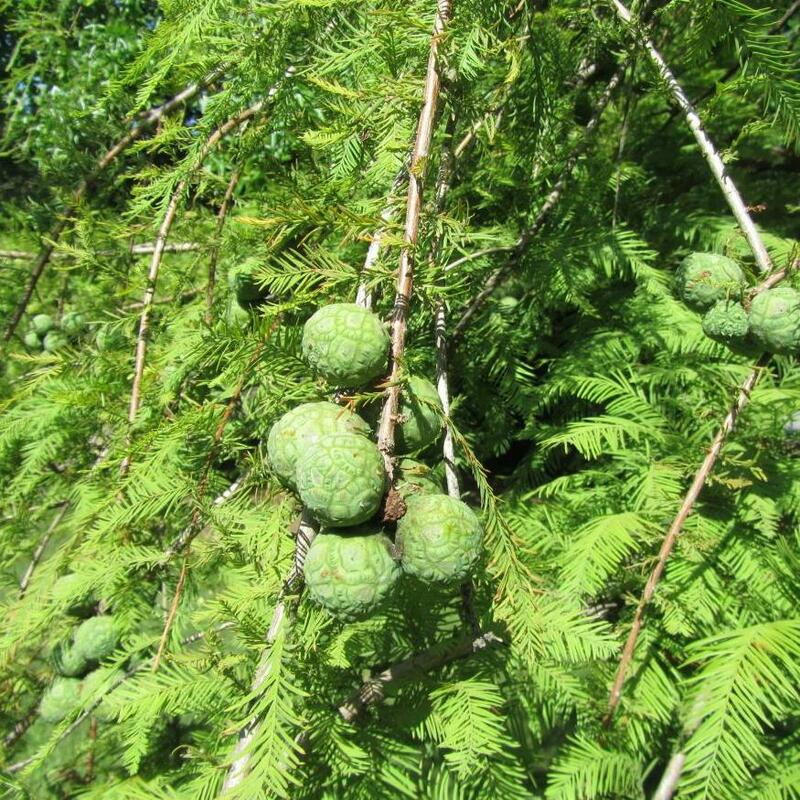 It is a "deciduous" conifer and will lose its needles in the fall like the metasequoia glyptostroboides (dawn redwood) and Larix decidua (larch). Tricolor European beech is a large deciduous tree growing to 50-60 feet tall. It has striking purple foliage with irregular pinkish-white and rose borders. The colonists brought this beech to America in the mid-1700s from central and southern Europe and it has been a popular ornamental shade tree ever since. The Siberian iris is common in perennial borders and is hardy in Zones 3 to 9. It grows in clumps 2–4 feet tall and up to 2 feet wide. The foliage is linear narrow sheaths. 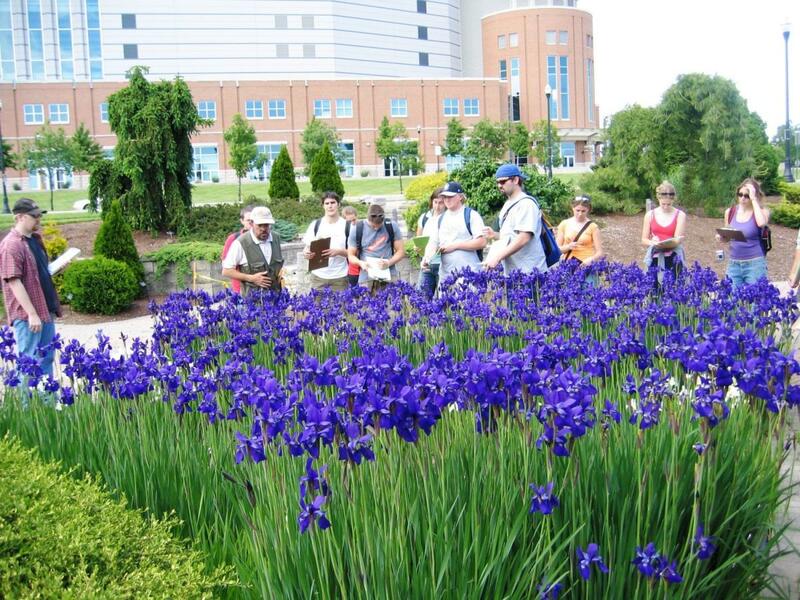 Blooms appear in late spring and the flowers come in many varieties with colors such as blue, purple, white, and yellow. Siberian irises can be found throughout the arboretum, including this beautiful spot in the Lane Avenue Gardens along the promenade in the Columbus Landscape Association Conifer Collection. A Japanese maple collection is located just south and across the Barbara Jean Johnson Promenade from the McCall Colorado Spruce Collection. The maple collection contains several cultivars of varying size and foliage types.